We had a great time at Maker Pfest this past Saturday! The Pflugerville Public Library is a beautiful community space and we were pleased to see so many excited visitors at Maker Pfest. Pflugerville Public Library is a nice place! Abdulkarim and Arami, both part of the UTeach Maker program, staffed the event. Abdulkarim talked to visitors about the golden ratio calipers and how this ratio shows up a lot in nature, including on our own bodies. 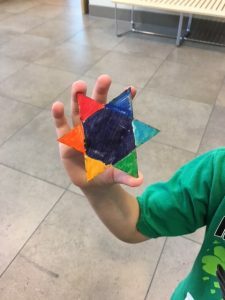 Arami facilitated the fractal magnet making and the Voronoi “Stained Glass” activities. Additionally, we showed off the Lewis Carroll coin trick puzzles (which most people solved impressively quickly), Napier’s bones (a cool multiplication tool), Pythagorean Theorem puzzles, tangrams, Voronoi patterns in microscope slides, and more! Arami taping the Voronoi frames together for our visitors. 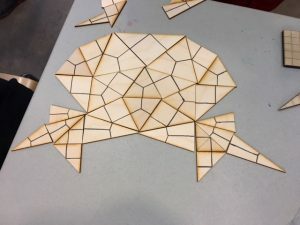 A family made a crab out of our new Voronoi Puzzle. People had fun playing Giant Tic Tac Toe outside. 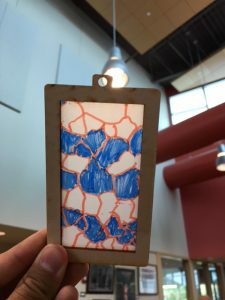 One of many creative Voronoi Stained Glass designs.